The array of the dishes of Nasi Kapau, Minangkabau Bukittinggi cuisine.Padang food is the cuisine of the Minangkabau people of West Sumatra, Indonesia. It is among the most popular food in Maritime Southeast Asia. 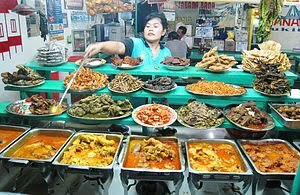 It is known across Indonesia as Masakan Padang (Padang cuisine, in English usually the simpler Padang food) after the city of Padang the capital city of West Sumatra province , it is served in restaurants opened by Minangkabau people in Indonesian cities. Padang food is ubiquitous in Indonesian cities, and is also popular in neighboring Malaysia and Singapore. The term "Padang food" is often used to designate the whole culinary traditions of Minangkabau people, however this term is seldom used in Minangkabau inland cities such as Bukittinggi that is also a culinary hotspot in West Sumatra and refer to it as Masakan Minang or Minangkabau food instead, since there is differences between Nasi Padang of Padang and Nasi Kapau of Bukittinggi. Because most of Minangkabau people are muslims, Minangkabau cuisine follows halal dietary law rigorously. Protein intake are mostly taken from beef, water buffalo, goat, and lamb meat, and also includes poultry and fishes. Minangkabau people are known for their fondness of cattle meat products including offal. Almost the whole parts of a cattle, such as meat, ribs, tongue, tail, liver, tripe, brain, bone marrow, spleen, intestine, cartilage, tendon, and even skin, are made to be Minangkabau delicacies. Seafood is popular in coastal West Sumatran cities, and most are grilled or fried with spicy chilli sauce or in curry gravy. Various of fishes, shrimp, and cuttlefish in also cooked in similar fashion. Most of Minangkabau food is eaten with hot steamed rice or compressed rice such as katupek (ketupat). Vegetables are mostly boiled such as boiled cassava leaf, or simmered in thin curry as side dishes, such as gulai (some kind of curry) of young jackfruit or cabbages. The hidang style Padang food served at Sederhana restaurant, all of the bowls of food are laid out in front of customer, the customer only pay for whatever bowl they eat from.In Padang food establishments, it is common to eat with one's hands. They usually serve kobokan, a bowl of tap water with a slice of lime in it to give a fresh scent. This bowl of water with lime in it should not to be consumed, however; it is used to wash one's hand before and after eating. If a customer do not wished to eat with bare hands, it is acceptable to ask for spoon and fork instead. 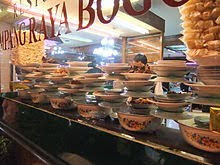 The cuisine is usually cooked once per day, and in restaurants customers choose from those dishes, which are left out on display in the window of Padang restaurant. During a dine-in hidang (serve) style Padang restaurant, after the customer being seated, the customer did not have to order first. The waiter immediately serves the dishes directly to the table, and the table will quickly be set with dozens of small dishes filled with highly-flavored foods such as beef rendang, curried fish, stewed greens, chili eggplant, curried beef liver, tripes, intestines, or foot tendons, fried beef lung, fried chicken, and of course, sambal, the spicy sauces ubiquitous at Indonesian tables. Customers take — and pay for — only what they want from this array of dishes. The best known Padang dish is rendang, a spicy meat stew. Soto Padang (crispy beef in spicy soup) is local residents' breakfast favorite, meanwhile sate (beef satay in curry sauce served with ketupat) is a treat in the evening. The serving style is different in Nasi Kapau food stall, a Minangkabau Bukittinggi style. After the customer being seated, the customer will be asked which one of dishes they have desired. The chosen dishes will be put directly upon the steamed rice or in separate small dishes. There are myriad Padang food establishments throughout Indonesia and the region, according to Ikatan Warung Padang Indonesia (Iwapin) or Warung Padang Bonds in greater Jakarta alone there are at least 20,000 Padang restaurant establishments. Several notable Minangkabau restaurant chains are Sederhana, Garuda, Pagi Sore, Simpang Raya, Sari Ratu, Sari Minang, Salero Bagindo and Natrabu. Ayam Pop, Padang style chicken, boiled/steamed and later fried. While fried chicken is golden brown, ayam pop is light colored. Snacks and drinksLemang mixture of sticky rice, coconut milk and pandan in thin bamboo (talang).